- All-State performances will be held as part of the annual TMEA Clinic/Convention, Feb. 13–16, 2019. Over 29,000 people from Texas and around the world will attend over 300 workshops, 100 performances, and visit over 1,400 exhibit booths at this nation’s largest music educators convention. Nicholaus Pantleo, a member of the Idalou H.S. Band will perform with the Texas All-State Band in San Antonio, Saturday, February 16, 2019 at the Henry B. Gonzalez Convention Center as part of the 2019 Texas Music Educators Association Clinic/Convention. He was chosen for this prestigious honor through a competitive process held this year across the state at District, Region, and Area levels. 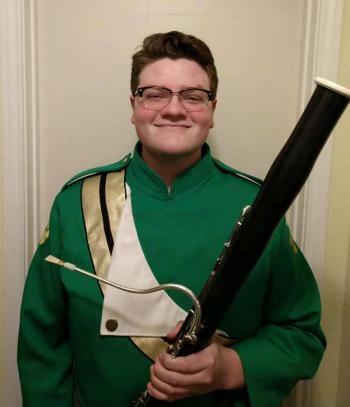 Nicholaus Pantleo is a student of Kathy Davis and plays at Idalou H.S. school under the direction of Patrick Pantleo who is a member of the Texas Music Educators Association, a 19,000+ member organization headquartered in Austin. This is Nicholaus Pantleo’s first time to perform as a member of a TMEA All-State organization. Nicholaus is the son of Lecia & Patrick Pantleo. These All-State students participate in three days of rehearsals directed by nationally-recognized conductors during the TMEA Clinic/Convention. Their performances for thousands of attendees bring this extraordinary event to a close. For the All-State concert schedule and conductor information, go to the Performances section ofwww.tmea.org/convention.